Integrity Music's release of 'Stand Up' by Luke Hellebronth will undoubtedly spread further the songs of a worship leader who has become a key figure in Worship Central. 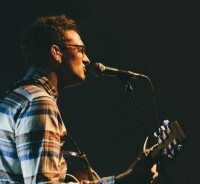 Luke began leading worship shortly after arriving in London in 2003 to study music at Trinity College Of Music. Throughout his studies he played in the worship team at church but it was in his small group one night that he was asked to lead for the first time. The regular worship leader had broken her arm and being the only other person to play an instrument Luke stepped in. Since then, the classically trained singer/guitarist has gone on from strength to strength. Many UK worshippers will have attended a Worship Central event or at least heard the two Worship Central live albums 'Spirit Break Out' (2011) and 'Let It Be Known' (2013) on which Luke made major contributions. He spoke about the ongoing work of the organisation which grew out of the Holy Trinity Brompton-founded Alpha International. He said, "Although we've released albums and songs, the main thing Worship Central is doing is training and equipping and investing in leaders. We've just recently released a Worship Central course which is a seven session course that worship teams can do together, to open up discussions on some big themes like why do we worship, what is it that we're doing when we get together as a worship team on a Sunday and it's not just playing some songs but what is it? And then looking a bit at the theology of worship and how do we play together as a team and how do we work together and how do we become authentic leaders? Lots of these sorts of big themes that often we find worship teams don't really discuss together. So we've put it all together in a seven week course, it's all free and it's all downloadable on line at WorshipCentral.org. It's a huge resource that we're really passionate about getting out there. Then we run an academy for worship leaders to come and spend some time with us. We also have on our website lots of blogs where we input new songs, and tell people about training events and conferences. Worship Central really is a whole load of resources. It's not just a brand, it's not just a band, it's really a ministry of worship to bring through the next generation of worship leaders." Luke explained that the songwriting and recording process to deliver 'Stand Up' took more than a year. "With songwriting in the process of recording an album, there are bits that are really quick and come together surprisingly well and then there are things that just take much longer to come through and develop. So 'Stand Up' took about a year in total. There were lots of people involved. It was a big team effort, right from writing the songs to getting the demos together, pre-production, recording, mixing and mastering right through to getting the album out. We actually used a few different recording studios, the main one was Chapel Studios which was great, a beautiful old chapel which has been converted into a studio. We did most of the band recording there and then I recorded my vocals at the studio for Holy Trinity Brompton. Then there was another studio used for some vocals, called Luna Sound in Brighton." There was quite a lot of co-writing involved on Luke's debut. Enthused Luke, "I love co-writing and getting the chance to work with different types of writers. It was a really fun and enjoyable process, getting in a room with someone you don't know, or someone you do know, and seeing what comes out of that writing session. 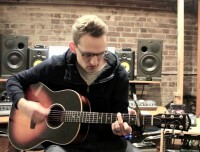 I wrote "Miracle Of Grace" with Aaron Keyes from the States. I met him for breakfast, we had about an hour just chatting and talking about life and what each of us were doing and then we had about an hour and a half left to write. That song came out of that time. It was an amazing blessing writing with him." To an outsider the co-writing process can sometimes seem a little indulgent. For instance, the "Awesome Is He" song on 'Stand Up' shows five composers. Luke laughingly explained, "I wrote the chorus with one guy Tom Smith in the Worship Central team. Then we put it together with a verse that I wrote with Nikki Fletcher, who is also part of the Worship Central team and is now in Australia. Then when we went into the studio the bridge came about with Ben Cantelon and Tim Hughes. So it was a real team effort, but I think the song is stronger for it - that Proverb of iron sharpening iron and that real sense that we can sharpen each other and finely tune ideas together." I asked Luke whether there was a particular theme that he was trying to convey on 'Stand Up'? "Not really. I hope that there is a broad enough picture of who God is from that album. I think a song like 'Awesome Is He', you're painting a big picture of who God is, really declaring who God is and his power and his might. Also I'm making some big claims through Jesus like mountains can move by faith and the dead can be raised. So hopefully there are real Gospel truths there as well. "Miracle Of Grace" was based on the story of the Prodigal Son. Another theme that I believe comes through is that the Spirit inspires us to stand up in this world and hopefully be his agents for change." The 28 year old worship leader was brought up in Norwich. His father is a professional violin and viola player. Luke admitted that it was a great advantage being surrounded by music in the home. He recounted, "I learnt guitar at 12 and really fell in love with the guitar. I decided that I wanted to take it further and music was always going to be my thing. I guess my dream was really to make music as a job, I loved it so much; to be a session musician, to gig and to play with different people. I played a lot with a group of friends at school in my sixth form years, we played a lot of jazz together and I really loved that. I think that was really about as far as I thought. But when I moved to London I started getting involved with worship and started to see the power of worship in encounters that people were having with God. That's when my view on worship changed a little bit from sort of a personal expression in improvisation to seeing how other people's lives can be changed in this dynamic of worship. That really was an eye opener. I started to really get into leading worship. I just love it. Then I started to write songs." Luke continued, "There were some great guys when I first joined HTB who have really been incredible leaders within the worship world. There is Andy Piercy and Dave Clifton, who did some brilliant songs and have been like fathers really in the worship world. Everything that Worship Central is involved with and is a part of now really comes out of that place. It's an amazing heritage. When I arrived Andy and Dave were there and Al Gordon was kind of running with the student worship ministry. They really had this dream for Worship Central. Then Tim Hughes came on board as well from Soul Survivor and Tim and Al started thinking through the whole plan for Worship Central and it started to gain momentum. I feel hugely privileged to be part of something with such a heritage."